Route 66 is an American TV series in which two young men traveled across America. The show ran weekly on CBS from 1960 to 1964. It starred Martin Milner as Tod Stiles and, for two and a half seasons, George Maharis as Buz Murdock. Maharis was ill for much of the third season, during which time Tod was shown traveling on his own. Tod met Lincoln Case, played by Glenn Corbett, late in the third season, and traveled with him until the end of the fourth and final season. The series is best remembered for its Corvette convertible and its instrumental theme song (composed and performed by Nelson Riddle), which became a major pop hit. 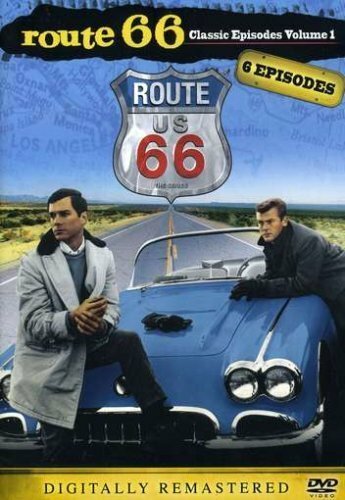 Route 66 was a hybrid between episodic television drama, which has continuing characters and situations, and the anthology format (e.g., The Twilight Zone), in which each week's show has a completely different cast and story. Route 66 had just three continuing characters, no more than two of whom appeared in the same episode. Like Richard Kimble from The Fugitive, the wanderers would move from place to place and get caught up in the struggles of the people there. Unlike Kimble, nothing was forcing them to stay on the move except their own sense of adventure, thus making it thematically closer to Run for Your Life, Movin' On, and Then Came Bronson. Later examples of this traveling protagonist format are programs such as Bearcats!, Quantum Leap, The Incredible Hulk, The A-Team, and Supernatural. This semi-anthology concept, where the drama is centered on the guest stars rather than the regular cast, was carried over from series creator Stirling Silliphant's previous drama Naked City (1958-1963). Both shows were recognized for their literate scripts and rich characterizations. The open-ended format, featuring two roaming observers/facilitators, gave Silliphant and the other writers an almost unlimited landscape for presenting a wide variety of dramatic (or comedic) story lines. Virtually any tale could be adapted to the series. The two regulars merely had to be worked in and the setting tailored to fit the location. The two men take odd jobs along their journey, like toiling in a California vineyard or manning a Maine lobster boat, bringing them in contact with dysfunctional families or troubled individuals in need of help. Tod and Buz (and later, Linc) symbolized restless youth searching for meaning in the early 1960s, but they were essentially non-characters. We learn almost nothing about them over the course of the series. All we are told is that, after the death of his father, Tod Stiles inherits a new Corvette and decides to drive across America with his friend Buz. Tod, portrayed by clean-cut Martin Milner, is the epitome of the decent, honest, all-American type. He is the moral anchor of the series. By contrast, the working-class Buz (George Maharis) is looser, hipper, more Beat Generation in attitude. His third-season replacement, Lincoln Case (Glenn Corbett), is a darker character, an army veteran haunted by his past. He's more introspective with a sometimes explosive temper, but is nonetheless a reliable companion on this soul-searching journey. The series concluded in Tampa with the two-part episode "Where There's a Will, There's a Way," in which Tod Stiles got married, and he and Linc finally settled down. This made the series one of the earliest prime-time television dramas to have a planned series finale resolving the fate of its main characters. The show was filmed and presented in black and white throughout its run. This was not unusual for early 1960s episodic TV. U.S. Route 66 is well-remembered for its cinematography and location filming. Writer-producer Stirling Silliphant traveled the country with a location manager (Sam Manners), scouting a wide range of locales and writing scripts to match the settings. The actors and film crew would arrive a few months later. Memorable locations include a logging camp, shrimp boats, an offshore oil rig, and Glen Canyon Dam, the latter while still under construction. It is one of very few series in the history of television to be filmed entirely on the road. This was done at a time when the United States was much less homogeneous than it is now. People, their accents, livelihoods, ethnic backgrounds and attitudes varied widely from one location to the next. Scripted characters reflected a far less mobile society, in which people were more apt to spend their entire lives in one small part of the country. Similarly, the places themselves were very different from one another visually, environmentally, architecturally, in goods and services available, etc. Stars Martin Milner and George Maharis both mentioned this in 1980s interviews. "Now you can go wherever you want," Maharis added by way of contrast, "and it's a Denny's."